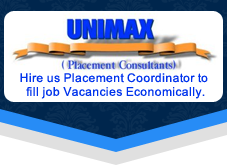 We take the privilege to introduce our company as placement Coordinator exists since 1994 specialized in providing technical & non technical manpower resources, at pan India level, managed by group of competent technical professionals. Company have expertise manpower to search relevant resume from database of leading jobs portal & committed to provide best service at competitive cost. Rs. 3000/- for single job vacancy against resume support shall be paid in favour of M/s UNIMAX in advance. No liability of any payment after selection of candidate. We shall be searching suitable resume from leading jobs portal resume database as per your job description & taking consent from candidates to participation in interview. Your jobs will be advertise in leading jobs portal & suitable candidates shall be search from resume response of jobs portal advertisement. List of Suitable candidate against your job description shall be email to you within 6 days. Validation period is for one month for placement coordination service hire by you against single job vacancy resume support.